Madera tables are constructed with environmentally friendly materials, and will give your facility all the safety of standard institutional furniture without the harsh look. 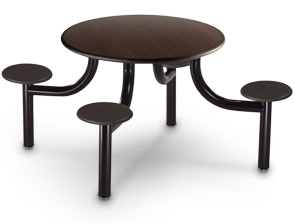 Tables feature natural looking wood-grain tops a softer appearance, and 3" diameter black legs for superior stability. 1-1/2" thick table tops are engineered for intensive-use with a commercial-grade laminate pressure-fused to a heavy-duty particleboard core with a special 65% vegetable oil molded edge. The rounded edges also feature a wood grain texture, and are rounded for safety and comfort. Choose from four natural wood-look laminates and two complementary edge colors to coordinate with your décor. Durable molded table edge - ideal for food service. Constructed of "green" materials - no Urea formaldehyde added. Low VOC's. Patented leg construction - welded to vertical seat support. Choose heavy duty, non-removable glides or bolt-down option. Four molded-in threaded inserts provide superior metal-to-metal connection. The fixed seats are ideal for food service, prisons, and institutions as they provide maximum security with ease of maintenance. The patented leg construction features a 14 gauge steel curved pipe fully welded to the vertical seat support. They are powder coated and conceal all hardware and reject moisture. 13" diameter seats are high density color impregnated compression molded composite that are highly scratch and stain resistant.